The effectiveness of the formula lies in the specific combinations and dosages of the herbs listed below. It was developed by Ross Rosen, MSTOM, LAc, CA, DIPL OM (NCCAOM), the founder of the Center for Acupuncture and Herbal Medicine. These unique combinations of Chinese herbs are designed to moisten the skin as well as nourish and invigorate the qi (energy) and blood circulation. This formulation penetrates beneath the skin to the fascia and muscles to increase surface circulation and reduce stagnant energy, blood and heat, while also nourishing the fluids and blood itself. Rooted in Classical Chinese dermatological formulas, Herbal Skin Therapy has been modified and expanded to suit the needs of modern skin conditions. Currently, the Original version and # 2 are available for purchase. Versions 3-6 will be made available shortly. The Original and # 2 treat all the conditions listed above, the difference being that #2 is weighted a little stronger towards chronic conditions that associate with increased pain and/or neuropathies. Tang Kuei (Dong Quai) and prepared Rehmannia allow the formula to penetrate into the fascia and blood level to improve microcirculation. Arnebia, Polygonum and unprepared Rehmannia treat a multitude of skin disorders by strengthening the blood and clearing heat and toxins from the blood and skin layer. Mother of Pearl, Peony and Glehnia moisten the skin. Fructus Tribulus and Uncis Uncaria treat itching and help the other herbs vent pathogens trapped in the skin and muscle layer. The applications are varied making this product invaluable to all patients suffering from skin disorders, as well as clinicians (massage therapists or health practitioners that engages in any form of touch therapy or dermatological/internal medicine). Eczema: These formulas have shown tremendous clinical success treating eczema and psoriasis in all their varied forms. Hair gel: the herbs in this formula have been known to strengthen the hair as well as eliminate grey hairs. 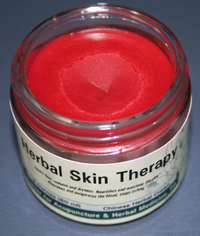 Herbal Skin Therapy strengthens, rejuvenates and moisturizes the hair. Many massage lotions and creams may cause acne and other allergic reactions in massage clients. 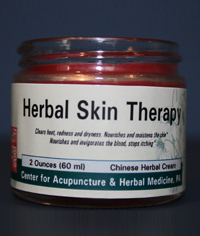 Herbal Skin Therapy will not, and will treat those conditions in clients already with these skin issues. Skin disorders listed above due to wind-heat, blood heat, wind-dryness, blood deficiency. This formula is safe and beneficial to use with patients with rashes, eczema, psoriasis and other skin disorders as it was designed by an herbalist to treat these conditions in a clinical setting. Excellent for treating traumatic injuries. Directions: Rinse and gargle for 30 seconds with 1/2 oz. of Herbal Mouth Therapy after each brushing.